As the panto season approaches, we remember the man credited with inventing the genre: theatre manager, impresario and performer, John Rich (1692 – 1761). He also opened the Theatre Royal, Covent Garden on this day in 1732. 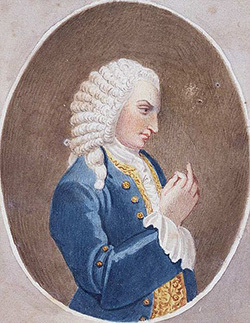 Rich had a lucky start on the London theatre scene, such as it was, inheriting from his father a royal patent to run a theatre, the privilege initially granted to Sir William Davenant by Charles II. But it wasn’t plain sailing, for he lacked an actual theatre, the building in Lincoln’s Inn Fields being still incomplete. It opened in 1714, but the early years were beset with financial problems. He was even forced to lease out his own theatre for a few years. 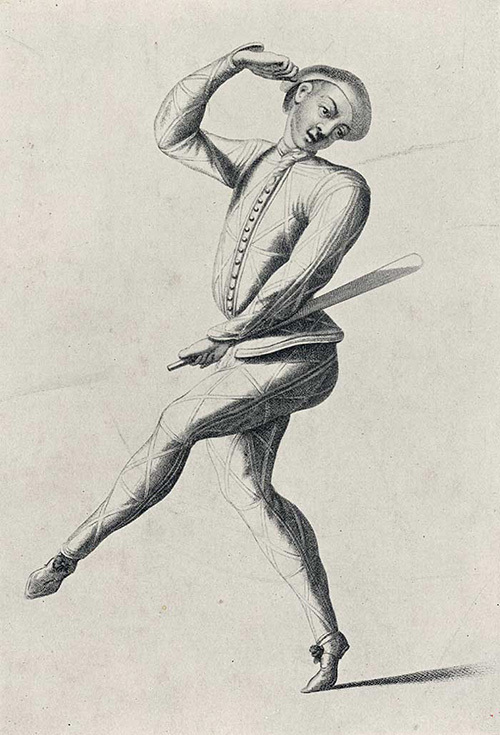 From 1717 right though the 1720s, Rich staged comic dance and drama mainly based on commedia dell’arte, himself constantly performing and building his reputation, almost inevitably in a harlequin role. His first blockbuster came in 1728 with John Gay’s Beggar’s Opera, the proceeds of which largely financed his new theatre, the Theatre Royal Covent Garden, which opened on 7 December 1732. He engaged some of the leading landscape painters of the day – notably George Lambert – to paint the scenery. John Rich, comic dancing in harlequin garb. From 1747, Rich’s biggest rival was David Garrick at the Theatre Royal Drury Lane and to a lesser extent Samuel Foote’s theatre in the Haymarket, whose output was often brilliant but just as often patchy and unapologetically political. The two titans of the Georgian stage locked theatrical horns throughout for the next decade, with Rich supplying more populist pantomime fare which also introduced ground breaking special effects, though Shakespeare was by no means ignored. Yet he drew sniffy criticism and even enmity from more literary London types such as Alexander Pope, Henry Fielding and Garrick himself. They dismissed him as vulgar, unlettered, even illiterate. But his friends and supporters included the likes of Hogarth, Samuel Johnson, John Wilkes. These were some of the original members of an early iteration of the Beefsteak Club, which Rich had founded and which in time even drew royal patronage through the person of Frederick, Prince of Wales. Not bad, he can’t have been the boor as portrayed by his detractors. Rich was also popular among his players for paying them promptly and treating them fairly, even supporting destitute retired actors. So all-in-all, a major figure in the story of London theatre, a mover, a shaker and all round good egg. John Rich. Main Source: Oxford Dictionary of National Biography (sub required). An interesting account of an interesting personality. The one point I would make is that your “(sub required)” might mislead people into thinking that they can access the excellent Oxford Dictionary of National Biography only by paying a subscription. This is not so. You can access it free of charge by signing in with the number of your public library membership card. Yes, thank you, you are perfectly correct. The dilemma I have is having to repeat this lengthy explanation every time I cite the excellent ODNB. But actually, I must take issue with the word “mislead”. Whether the sub is free via your library or paid for with actual money, it is still a sub.